Yup, this one is pretty big. Pretty big in size, I mean. I’m uploading the files for the second set of Christmas Lullaby and it’s taking forever. I wonder if something’s up with 4shared, because lately it’s been taking a whole lotta time to upload even the small files. This set has a complete set of alpha tags (the C-tag that you see is shown in actual size… relative to the size of the layout, that is), so you can go as big or as small as you want. Each tag has a sewn-on letter and a lightly-debossed word. 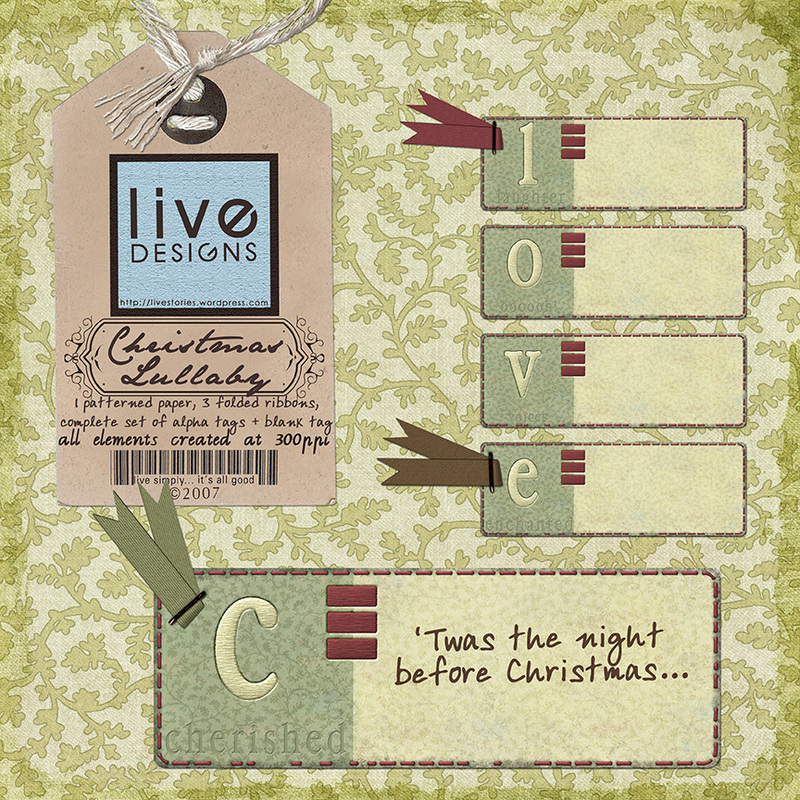 I’ve included folded ribbon staples in three colors in case you need something to attach the labels with. The patterned paper you see in the background is included with this set as well. Oh well. I think I may further divide the upload into 3 or even 4 parts so that you don’t end up waiting too long. I’ll be back tomorrow (that’s actually today… just give me about 4 hours to sleep) so I can post the links. Much as I’d love to be able to do that now, I need to be patient and wait for 4shared to do its work. Patience. Is. A. Virtue. Auuuugh! Will be back tomorrow with the links, my sweeties! Will update this post once I have them. Categories goodies & freebies, Share the Digi Love! Go to sleep … Go to sleep … go to sleep dear Liv. Yea, I can’t sing. sorry. Thanks for trying to upload. The preview is gorgeous!!! I’ll sit here patiently waiting … drumming my fingers (sorry it’s a nervous habit) but I’ll be here. You rest and revive that brain of yours. You don’t have to fret about us. You know we will all be here to grab your ginormous gorgeous freebies whenever you can get them uploaded. Thanks GF!!! Love ya!